A rendering from page 44 of the "Final Report of Coastal Resilience Solutions for East Boston and Charlestown,” which shows Charlestown’s long-term climate resilient waterfront strategy. In a bid to prepare Boston for the threat of rising sea levels, Mayor Martin J. Walsh is betting big on waterfront parks as a defense against damaging floods. Walsh on Wednesday rolled out a citywide plan that centers around creating new parks — and making improvements to existing ones — to help plug low-lying spots along Boston’s 47 miles of coastline and to act as a buffer for residential neighborhoods. The ambitious proposal includes parks from Belle Isle Marsh in East Boston to Sargent’s Wharf downtown to Tenean Beach in Dorchester. 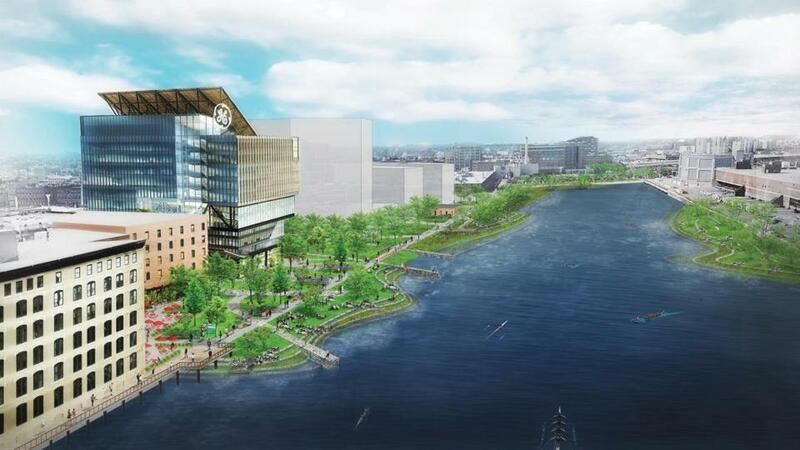 It would add 67 acres of public open space in all, and it calls for building sea walls along privately owned sections of the Harborwalk, as well as raising low-lying streets such as Morrissey Boulevard in Dorchester and Main Street in Charlestown. In addition to offering protection from storms, Walsh said, the plan would make more of the waterfront accessible to the public. His push comes amid growing alarm over sea level rise. Last week, a United Nations report warned that global climate change could reach crisis levels as soon as 2040, earlier than previously predicted. Locally, there are worries about the increased likelihood of flooding in sections of the city — like the Seaport District — that are attracting more businesses and residents. Last winter, powerful storms temporarily put parts of downtown and the Seaport underwater. Several of the ideas Walsh raised Wednesday have been in the works for some time, as part of the Climate Ready Boston plan released in late 2016 and neighborhood-level plans drawn up for East Boston and Charlestown since that report. Others are new. The broader push is intended to spur coordinated action citywide, Walsh said. The Chamber of Commerce set seemed willing to help — even though the cost is far from clear. But it’s largely missing one key ingredient: money to get the work done. 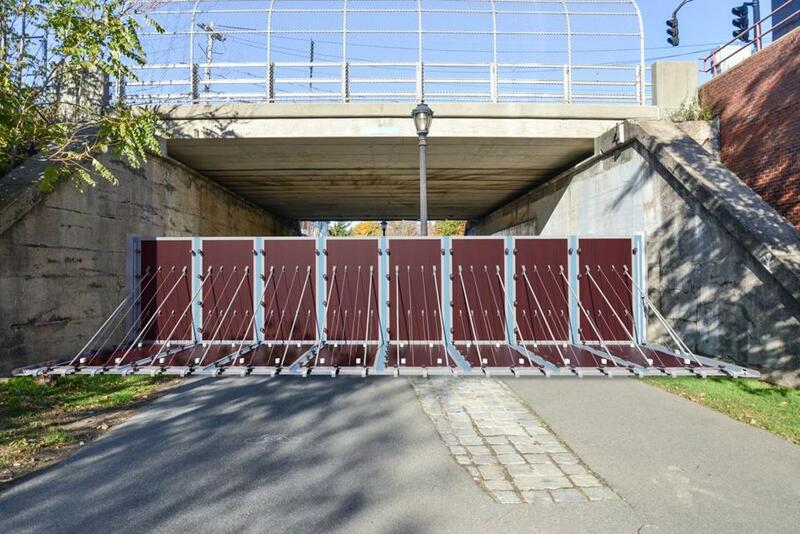 A deployable flood barrier at the mouth of the Greenway in East Boston. 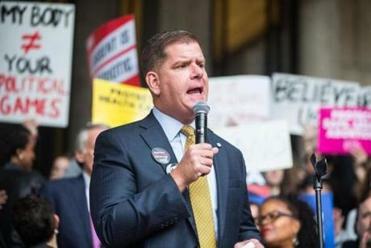 Walsh pledged to dedicate 10 percent of the city’s capital budget — about $16 million a year — to the climate change projects, a small fraction of what will be needed. City officials say it’s too soon to estimate costs of projects that will likely roll out over decades, though a neighborhood plan released Wednesday that covers much of South Boston estimated improvements there alone will require as much as $1 billion. Walsh said he plans to work with the state and will also seek federal funding. The city is applying for a $10 million “pre-disaster mitigation grant” from the Federal Emergency Management Agency for improvements along Fort Point Channel. But businesses and private foundations will likely also need to help pay for the work, Walsh said. At a Greater Boston Chamber of Commerce speech Wednesday, business leaders seemed supportive of the mayor’s plan. He received a longer-than-usual standing ovation, and several executives approached him afterward to offer their backing. A rendering from page 13 of the “Executive Summary of Coastal Resilience Solutions of South Boston” of long-term flood protection such as what is shown here for Fort Point Channel can also improve quality of life. They should, said Jim Canales, president of the Barr Foundation, a nonprofit that has pumped millions of dollars into climate planning locally in recent years and plans to dole out $5 million more in resiliency-related grants this year. Landscape experts say Walsh’s plan sounds promising, with the potential to protect large areas of the city through what, over time, would be a relatively small investment. For instance, the city estimates that raising Ryan Playground, near the Schrafft’s Center in Charlestown, would cost $3 million to $6 million. That project could offer crucial protection to parts of Charlestown, Somerville, and Cambridge in the event the Mystic River overflows. Building up both Moakley Park in South Boston and the banks of Fort Point Channel could protect South Boston’s Dorchester Avenue corridor — where the city envisions 6,000 to 8,000 new units of housing in coming years — as well as Widett Circle and parts of the South End and Roxbury. 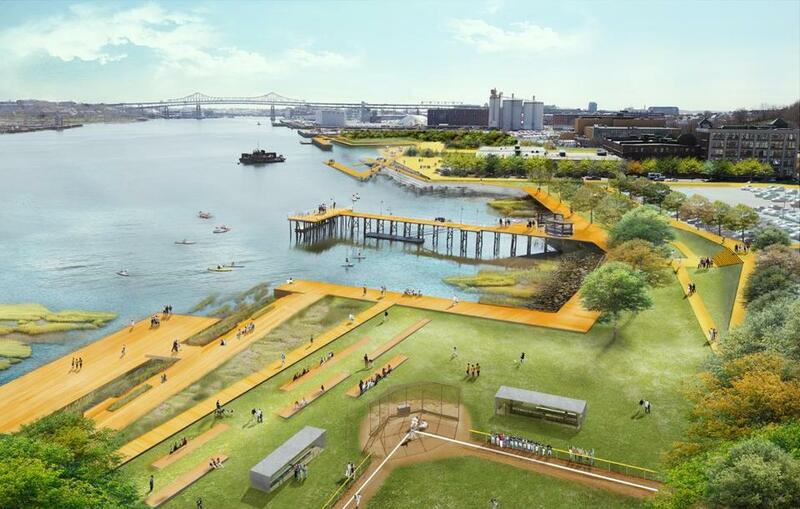 The trick is to design parks that will both block floods and become more attractive for people to use, said Amy Whitesides, studio director at Stoss, a landscape architecture firm that’s working on a plan for Moakley Park. Often, elevating a park by just a few feet can make all the difference in a flood, she said, while maintaining the qualities that make a park attractive and useful the rest of the time. Still, the focus on public land highlights what some say is a limitation of Walsh’s plan. While the city already urges developers to plan for sea level rise in new buildings on the waterfront, it stops short of requiring them to do so. Nor has there been any move to require landowners to help pay for broader protections. That will probably need to change for this plan to work, said Deanna Moran, director of environmental planning at the Conservation Law Foundation. Bud Ris, a former New England Aquarium CEO who is advising Boston’s Green Ribbon Commission on climate change, said he expects there will eventually be state bonds, and perhaps special taxing districts, to finance some of the ideas outlined in the city’s proposal. He also expects city officials to push developers to do more to protect their building sites. Where, and how, those protections and public spaces get built will say a lot about whether the plan can work, said Kathy Abbott, chief executive of Boston Harbor Now, a nonprofit that advocates for waterfront access.